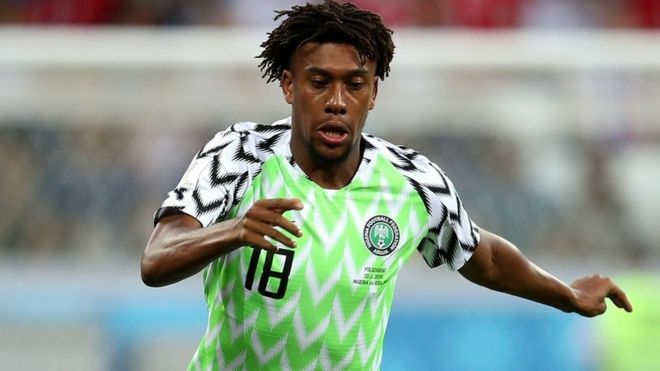 According to the latest monthly update by CIES Football Observatory, Arsenal winger Alex Iwobi has overtaken Leicester City midfielder Wilfred Ndidi as the most valuable Nigerian footballer. Valued at €52.4 million, he is the only Nigerian player worth above 50 million euros across the top five leagues in Europe. The winger recorded good performances in the month of october and featured in every single game played by Arsenal and the Super Eagles, hence the increase in his value. Leicester City midfielder Wilfred Ndidi is second on the list as he is worth €49.8 million. Chelsea winger Wilfred Ndidi who is worth €49.8 million Victor Moses is the third most valuable Nigerian player at €37.4m; Kelechi Iheanacho (€17.5m) and Bordeaux’ Samuel Kalu (€8.3m) all made up the top five. The most expensive Nigerian defender is Udinese’s William Troost- Ekong Valued at €6.1m while Villarreal Samuel Chukwueze is the most valuable Nigerian teenager at €3.6m. Congratulations to Alex Iwobi. I hope that he will rise his stock value in the future as well. I think that he needs to leave Arsenal to fulfil his true potential. To cement your legacy as greats, you need to win trophies for it. I don't think that Arsenal are eqipped to win something big. Am I right guys? You should be. But it's your opinion?